The most beautiful lamp posts in Malaysia can be said to be found in the new administrative capital of Putrajaya. 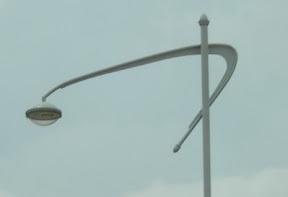 It appears as if every road there must have lamp posts with its own distinctive design. But the signature lamp posts along with the signature bridges and buildings, do not make this new city a place that I would like to live in (even if I could afford to buy a decent house there)! 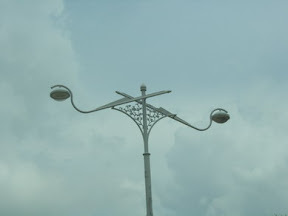 For me, the most interesting lamposts are along the Middle Ring Road, alongside Taman Melawati. Yesterday was Labour Day holiday. On a family outing to the zoo, I've discovered that they are Milky Storks or 'Burung Upeh Botak' (bald upeh bird). There was a large flock of them on an island in the zoo's lake. They are not fenced in, so sometimes they fly out. 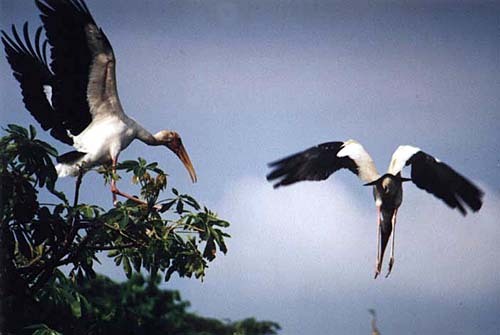 "The globally threatened Milky Stork 'Mycteria cinerea' faces extinction in the wild in Malaysia, according to Yeap Chin Aik of the Malaysian Nature Society. The species is a predominantly a coastal resident in Indonesia and Malaysia, inhabiting mangroves and adjacent swamps.....(but) these tidal forests are threatened by agricultural conversion and development schemes, particularly large-scale fish farms, tidal rice cultivation, logging and related disturbance". This bit of information makes me more eager to look out for these birds anytime I'm in the neighbourhood! They say beauty is only skin deep. 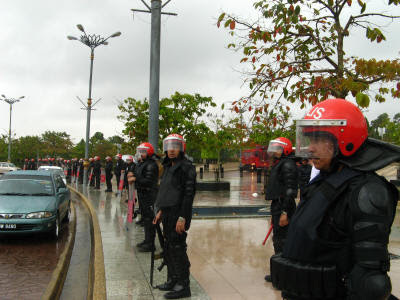 Looks like Putrajaya falls into that category. I like the lamp post that the birds sit on the best. 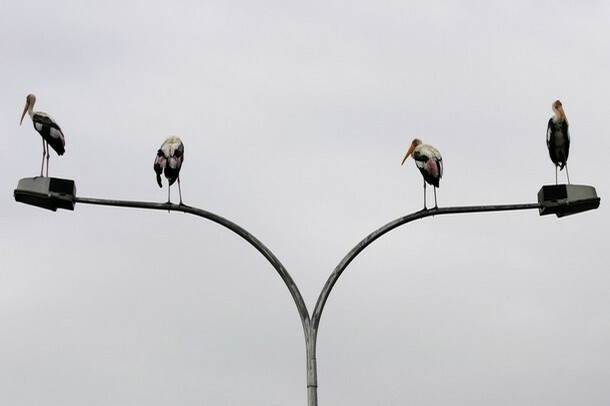 If you drive along Jalan Hulu Kelang in the evenings, especially during cold days just after a heavy rain, chances are that you would have seen these birds perched on the street lamps. I spent 2 months in Malaysia last year, mainly KL and surrounding areas. Great stuff, thanks for the pictures.